When you unfold the map, charting your trip to Gold Butte, you will find upon examination of the map that Gold Butte is but a small label on a peak hidden in the vast expanse of rough Nevada desert. Over time the name Gold Butte has grown to encompass the stretch of unforgiving desert between the two rivers of the Colorado and the Virgin along the southeast Nevada border. While touring the back country of Gold Butte you will uncover some of Clark County Nevada’s greatest treasures. Gold Butte is home to a rich abundance of natural history and cultural landmarks. The journey beings once you turn off Riverside Road and start heading down Gold Butte Road. One of the first great destinations in the Gold Butte back country is the Luke Whitney Petroglyphs. The red and white sandstone rocks in this area are beautiful just in themselves however once you start hiking through these rocks you will find the traces of some of Americas earliest inhabitants. Much of the desert varnish painted on these sandstone faces are filled with rock art carvings. Another great stop along these back country roads is Whitney Pockets. This is another area that is filled with incredible sandstone formations with a colorful mix of desert colors and human history. You can visit the dam used to catch run off water, the stone rooms built out of the pockets in the side of the sandstone or just setup camp at one of the many great spots found in the area. Whitney pockets is the end of the black top but just the jumping off point for many other incredible destinations found within the Gold Butte area. A few miles on down the road from Whitney Pockets is Devils Throat. This is an amazing sight just off the main road headed down mud wash. This geologic formation was most likely created when the circulating ground water dissolved much of the earth beneath the surface and it became too week to support the weight. What is left is a sink hole approximately 75 feet across and roughly 120 feet deep, however the bottom of the hole is quite angled from one side to the other. There is now a fence around the sink hole but back when gramps was running cattle through this country this was an area to be avoided when looking for lost cows late into the evening. Once you hit Devils Throat you can continue down mud wash and head for Red Bluff Springs and Keyhole Canyon or you can continue down the main Gold Butte Road and head for Gold Butte Headquarters, Azure Ridge, Hells Kitchen, Cedar Basin, the Colorado River, Lake Mead or many other great destinations hidden within this incredible back country. 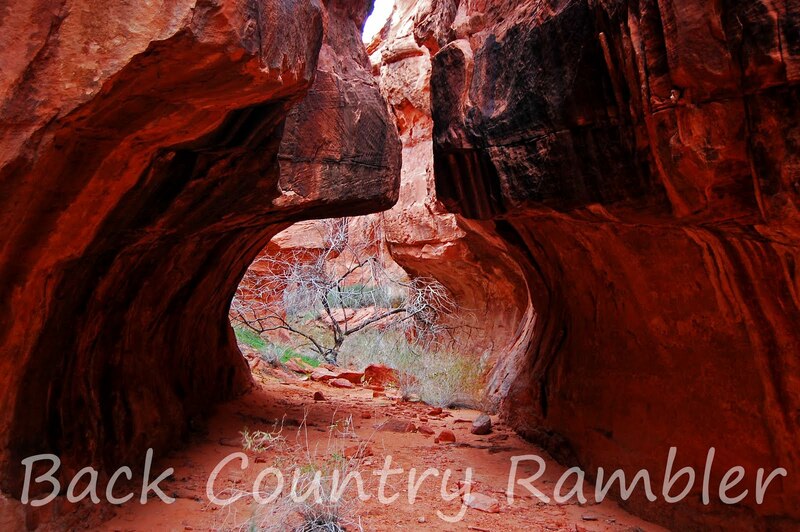 To see photographs, maps, information and history about specific places found within the Gold Butte back country visit Back Country Rambler or Click Here to see all the trips found at Gold Butte that I have taken so far.